Wicklow Golf Club was Designed by Pat Ruddy and the late Tom Craddock, this course is set between the scenic splendour of the Wicklow Mountains and the Irish Sea. 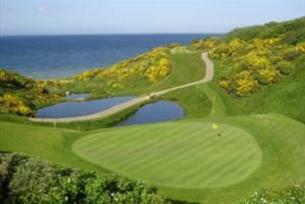 You will find 18 holes of unbeatable golfing pleasure at Wicklow Golf Club. Wicklow Golf Club is a picturesque, parkland course that follows the coastline of Wicklow Bay and is situated in the historic town of Wicklow. Each of the 18 holes makes full use of the contours and natural features of the cliff top terrain, providing a challenging test for even the most ardent golfer. The clubhouse facilities complete the perfect golfing experience. You will find panoramic views, excellent golf, bar and dining facilities and, of course, a welcome that will make you feel right at home. But don't take our word for it, come and experience it yourself. 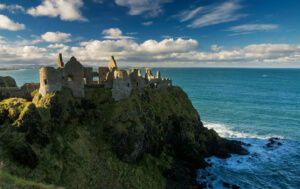 Welcome to one of the world's best roadtrips: the Causeway Coastal Route. Take the ferry to Ireland and choose from a wide range of destination ports. Cruise Through the Heart of Dublin City this summer! Adult Ticket retail rate: €15 per person. Discounted rate €10.80 per person. (20% special offer discount plus already available 10% online discount). Offer applies to all tickets except the Family ticket.